A liquid herbicide that is quickly absorbed by plants. Used best around docks and in swimming areas. Dibrox® Diquat herbicide effectively controls a wide variety of submerged weeds such as milfoil and hydrilla. Suitable for treating small areas, such as around a dock or swimming area. For a more complete solution, we recommend using additional pond weed control products to tackle floating and submerged weeds and algae. Enjoy your summer on the water weed and algae free. 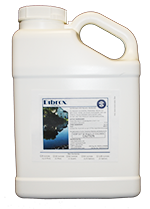 Dibrox® Diquat herbicide is quickly absorbed by submerged plants like milfoil and hydrilla, allowing for aquatic weed control to be obtained in small areas of large water bodies. Completely safe with no fishing or swimming restrictions. Refer to your state's regulations for use of Dibrox® Diquat herbicide in public waters (lakes) and for permit information. Some states may require a license, or similar certification, in order to apply this product. Diquat at 15 ounces per 0.1 surface area acre at 4 ft average death with non Ionic surfactant and 5 ounces 2--4D had 100 % kill of duck weed. This N W Arkansas stock pond was 100% covered with duck weed. The duckweed had been mechanically removed twice. Ph adjustment of water and enzyme and water chemistry were not preventing the exponential growth the Diquat was effective in 72 hours.